The X-ALL MOUNTAIN tool combines all the best elements - same shaft curve as the X-DREAM plus vice-like head and affordable accessories that come standard on the X-ALP. 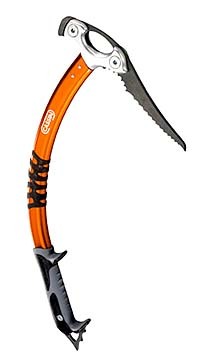 Out-of-the-box the X-ALL MOUNTAIN is set for leashless ice and mixed climbing - with the X-DRY GRIP, SPIKE & HAMMER. It is light, precise and the "beaked" X-ALL PICK assures energy efficient & secure "sticks", ease of removal and a "3 tooth" platform to resist skating off dry holds. Tune your ALL MOUNTAIN to the route and conditions - if you're headed into the alpine - change out the handle, add some leashes and maybe a pair of wrist loops. Made in Italy, 3 year guarantee, shipped everywhere.